Another lovely evening for riding tonight. First I got on Poppy and she was her usual good self. We did a little jumping and she was still a bit full of herself but I really think she was happy to be jumping. We stayed pretty small, 3ft is pretty much her warm up now. I really don't jump big at home. 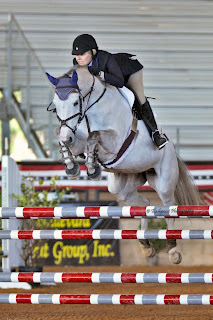 I will put them up a little before a show but I really try to keep jumping to a minimum and focus on flat work. There are a few reasons I do this. Most importantly to save my horse. I think that most of the time we are jumping for our own learning and not theirs (unless we are talking about a greenie). The other reasons are that I don't have a big fancy ring with expensive footing. I jump in my small grass field (aka my front yard) so often the weather conditions dictate whether I should jump or not (ie I'm not jumping on wet or soggy grass). And lastly, I am usually by myself. This is also why I said in a prior post that I make it a point to show once a month. This keeps both my horses and myself in a rhythm. I meet my trainer at the shows and get my lessons there. After a show whatever I learned that I need to work on I go home and do it. 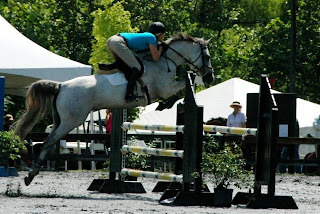 I also have very basic jumps so by showing often my horses get exposed to various things and it becomes norm. When needed I go lesson at my trainer's barn where she has all sorts of spooky jumps. Anyway, Poppy was great tonight. I even did a little course. Of course riding alone there's always the question, "oh should I lower that jump? It's a little big, we haven't jumped in awhile. Wait that requires getting off. Never mind, it's the perfect height." Next I hacked Tank. He was really good and it was getting late so it was just a short ride. Hopefully tomorrow will be another dry day so I can jump him around. I've had him for 6 years and brought him along from being a greenie so he is my "steady eddie." 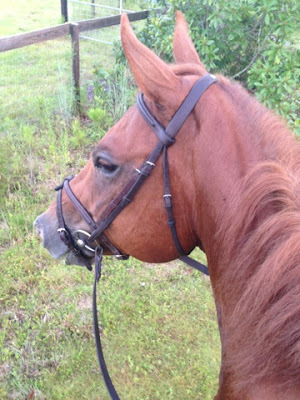 Other than being wild if he hasn't been ridden in awhile he is pretty consistent and knows his job. He is super fun to ride. His name is tank for a reason, he's 16.2 but just solid and thick. The day I bought him and took him off the trailer the first thing my husband said was "he's like a tank." It stuck. This was Poppy's 3rd show, almost 2 years ago. Have you ever owned a horse that you no longer enjoyed riding? For the first time in my 30+ years of riding, I am at that point. Ketel has been on his ulcer meds for 2 weeks now so I thought that on Monday I would put him on the lunge and see how he was. He was wild. But at least he was moving forward and not rearing. Good start. Tuesday, more time on the lunge and he was fantastic. 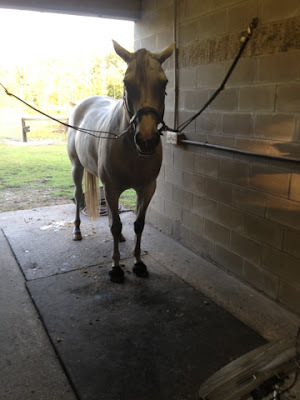 Today I lunged him in his tack and thought if all goes well again I will get on. It did and when I started to lead him to the mounting block it hit me. Dread. I absolutely did not want to get on him. I have lost all trust and faith in this horse. Plain and simple it is not fun to ride a horse that is bucking and rearing and you get no where with. Plus I ride at home and most of the time I am alone. I got on anyway and initially he was fine walking around and then it started. He did not want to move past the gate and pitched a tantrum every time. So then it's the confirmation of "see this is exactly why I didn't want to ride him." This is disappointing for so many reasons. He was the reason I started blogging. I wanted to document our journey of bringing along an OTTB. 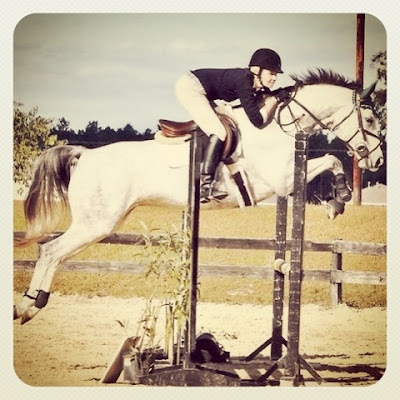 It's disappointing because I wanted to take him to the big shows with me and prove to my counterparts that OTTBs are awesome and you don't need a big fancy expensive warmblood. But most of all it is disappointing because I feel like he is becoming the stereotypical crazy OTTB and proving the naysayers right. I texted my trainer who immediately replied to bring him to her. So Ketel is going to "Naughty Pony Camp." Poppy went to camp once too. Sometimes no matter how long you've been riding and training horses you need some help. This is also one of challenges of riding at home and not being at a training facility. Hubby fixed the brakes on my truck this evening so now I just need to figure out when I can make time to get Ketel to camp. On a positive note we have had a few dry days so the ground dried up enough for me to jump Poppy around. I don't remember the last time I jumped her due to the awful weather we have been having. She was a bit full of herself but rightfully so given she hasn't been on our regular program. Now that one... I love to ride. Bleh is about the best way for my to describe how I'm feeling here lately. Last I blogged I had scratched Ketel from his first show and Tank was going to fill in since I couldn't get my entries refunded. Ketel started on some ulcer meds and got an adjustment from the chiropractor. I gave him some time off and focused on getting my big, heavy, "jump off ready" jumper Tank to quietly ride a dressage test with a new bridle (apparently everything I use on him is illegal in dressage). I worked hard with him and eventually he succumbed and was nicely doing the tests. I spent all day that Saturday getting ready (my ride time was 6:14pm) and just when I was about to load Tank on the trailer my friend texted me that she scratched because the weather was supposed to be bad. Ummmm....it's indoors. Well I wasn't about to go to a dressage show by myself when I don't even ride dressage and don't know anyone there so I scratched. Good bye wasted money. I'm going to start Ketel back on the lunge this week. Hopefully I can get back on him and see how he is feeling. My trainer offered to take him for a couple of weeks so I may go that route. For now I am doing the "Go Away Rain" dance! 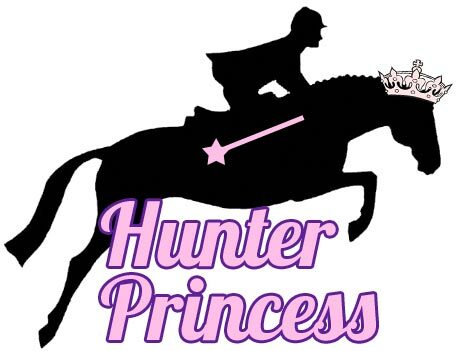 I would be better suited as the Jumper Princess first off. Well, Poppy would probably be the princess more than me. For this week's blog hop, what is your dream division? Easy. High Junior Amateur Jumpers. I have always wanted to be able to complete in the Welcome Classics. I felt maybe that was more reasonable than the Grand Prixs and as I get older I get less gutsy. I finally purchased a prospect that shows the talent that could possibly take us there. 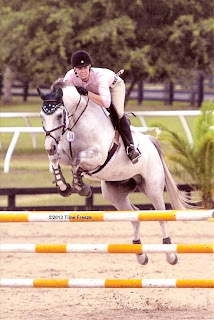 We currently complete in the 1.10/1.15m. Next up will be 1.20/1.25m so 1.30/1.35m doesn't seem too far off (maybe). I am bummed. Tonight I scratched Ketel from the dressage show on Saturday that I was planning to use as a great low key introduction to showing for him. I decided to scratch him because he is being naughty. The big question looming over me is why. Is he not feeling well or is he being a brat? So I was never given an answer of when he could get on him and soon the weekend came and went. In the meantime my mind is spinning. I got a hold of a chiropractor to come evaluate him Sat. 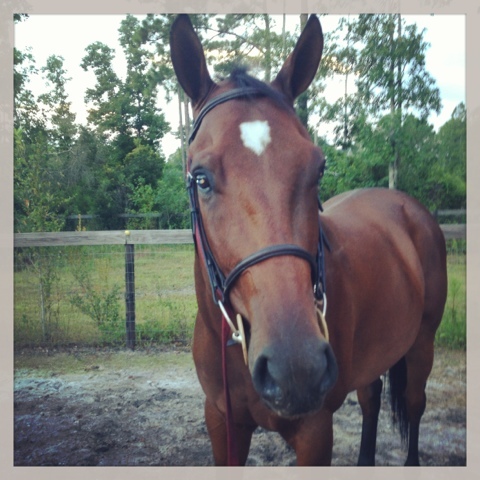 I lunged him last night and he was great. But I still keep wondering what the problem could be? I have read and read and thought so hard my head hurts. Feed issue (He switched from T&A to Peanut)? Ulcers? Back soreness? Teeth? So chiropractor is coming out Saturday. His appetite is good, he is gaining weight, his coat is shiny so I wasn't even considering ulcers. But I read an article today that said sometimes their whole body will be shiny but not their chest. So I freak out because his chest is dull and not shiny (am I losing my mind or what???). So I call my vet. Yes it could be the hay change, yes is could be ulcers, and yes it could be that he needs a chiro. After much discussion we decide to try him on some ulcer meds and see how he responds. I will pick up meds tomorrow. He's been off the peanut since Sunday so I decided to see how he rode tonight and rule that out. I got on and as soon as I asked him to pick up the trot he tried to go up again. Same thing any time I asked him to trot. Even with no leg and just verbal cues. I can't get a refund for my entries this late so I am going to take Tank. I am just disappointed. The whole point of going to this show was for Ketel. I feel like a a let down since I couldn't work him through this.. Here is our jump off. We finished 3rd.